Asia is currently in the middle of an unprecedented arms race that is not only sharpening tensions in the region but also competing with efforts by Asian countries to address poverty and growing economic disparity. Asia is currently in the middle of an unprecedented arms race that is not only sharpening tensions in the region but also competing with efforts by Asian countries to address poverty and growing economic disparity. The gap between rich and poor—calculated by the Gini coefficient that measures inequality—has increased from 39 percent to 46 percent in China, India, and Indonesia. Although affluent households continue to garner larger and larger portions of the economic pie, “Children born to poor families can be 10 times more likely to die in infancy” than those from wealthy families, according to Changyong Rhee, chief economist of the Asian Development Bank. This inequality trend is particularly acute in India, where life expectancy is low, infant mortality high, education spotty, and illiteracy widespread, despite that country’s status as the third-largest economy in Asia, behind China and Japan. According to an independent charity, the Naandi Foundation, some 42 percent of India’s children are malnourished. Bangladesh, a far poorer country, does considerably better in all these areas. And yet last year India was the world’s leading arms purchaser, exemplified by a $20-billion purchase of high-performance French fighter planes. India is also developing a long-range ballistic missile capable of carrying multiple nuclear warheads, as well as buying submarines and surface craft. Its military budget is set to rise 17 percent this year to $42 billion. “It is ridiculous. We are getting into a useless arms race at the expense of fulfilling the needs of poor people,” Praful Bidwai of the Coalition of Nuclear Disarmament and Peace told The New York Times. China, too, is in the middle of an arms boom that includes beefing up its navy, constructing a new generation of stealth aircraft, and developing a ballistic missile that is potentially capable of neutralizing U.S. carriers near its coast. 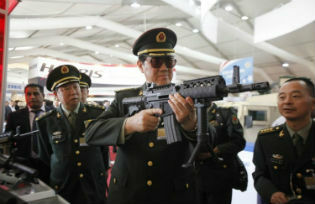 Beijing’s arms budget has grown at a rate of some 12 percent a year and, at $106.41 billion, is now the second-largest on the planet. The overall U.S. budget for national security—not counting the various wars Washington is embroiled in—runs a little over $800 billion, although some have estimated it at over $1 trillion. Although China has made enormous strides in overcoming poverty, some 250 million Chinese officially are still considered poor, and the country’s formerly red-hot economy is cooling. “Data on April spending and output put another nail into hopes that China’s economy is bottoming out,” Mark Williams, chief Asia economist at Capital Economics, told the Financial Times. The same is true for most of Asia. For instance, India’s annual economic growth rate has fallen from 9 percent to 6.1 percent over the past two and a half years. Tensions between China and other nations in the region have set off a local arms race. Taiwan is buying four U.S.-made Perry-class guided missile frigates, and Japan has shifted much of its military from its northern islands to face southward toward China. The Philippines are spending almost $1 billion on new aircraft and radar, and recently held joint war games with the United States. South Korea has just successfully tested a long-range cruise missile. Washington is reviving ties with Indonesia’s brutal military because the island nation controls the strategic seaways through which pass most of the region’s trade and energy supplies. But that “role” is by no means clear, and some have read Smith’s statement as an attempt to rope New Delhi into a united front against Beijing. The recent test of India’s Agni V nuclear-capable ballistic missile is largely seen as directed at China. China’s forceful stance in the South China Sea has stirred up tensions with Vietnam, Taiwan, Brunei, and Malaysia as well. A standoff last month between a Philippine warship and several Chinese surveillance ships at Scarborough Shoal is still on a low simmer. China’s more assertive posture in the region stems largely from the 1995-96 Taiwan Straits crisis that saw two U.S. carriers humiliate Beijing in its home waters. There was little serious danger of war during the crisis—China does not have the capability to invade Taiwan—but the Clinton administration took the opportunity to demonstrate U.S. naval power. China’s naval build-up dates from that incident. The recent “pivot” by Obama administration toward Asia, including a military buildup on Wake and Guam and the deployment of 2,500 Marines in Australia, has heightened tensions in the region, and Beijing’s heavy-handedness in the South China Sea has given Washington an opening to insert itself into the dispute. China is prickly about its home waters—one can hardly blame it, given the history of the past 100 years—but there is no evidence that it is expansionist. A Chinese Foreign Ministry spokesman said in February, “No country, including China, has claimed sovereignty over the entire South China Sea.” Nor does Beijing seem eager to use military force. Beijing has drawn some lessons from its disastrous 1979 invasion of Vietnam. On the other hand, Beijing is seriously concerned about who controls the region’s seas, in part because some 80 percent of China’s energy supplies pass through maritime choke points controlled by the United States and its allies. The tensions in Asia are real, if not as sharp or deep as they have been portrayed in the U.S. media. China and India do, indeed, have border “problems,” but China also describes itself and New Delhi as “not competitors but partners,” and has even offered an alliance to keep “foreign powers”—read the United States and NATO—from meddling in the region. Americans have ignored Eisenhower’s warning. Asian nations would do well to pay attention.